[For an interview with Enver Yusuf, an ethnic Uighur, press here. For as many as 4,000 years, the salty sand of the Taklimakan Desert in China held a secret-unusually well-preserved mummies wearing colorful robes, boots, stockings and hats. Today, the mummies still hold a mystery: The people were Caucasian, not Asian. "We are trying to figure out, from many different angles, who these people were and where they came from," Dr. Victor H. Mair said. "It's important to the question of how civilization developed across Eurasia." More than 40 scholars from around the world presented papers recently on the "Mystery Mummies" at the University of Pennsylvania Museum. Archaeologists have been exhuming the desiccated bodies in the Tarim Basin of Xinjiang province since the late 1970s, but the conference was the first organized exchange of information about them, according to Mair, the Penn professor coordinating the conference. Even a novice can see the mummies' Caucasian characteristics- brown-blonde hair, deep-set eyes and long noses and faces. Dr. Han Kangxin of the Chinese Academy of Social Sciences in Beijing reached the same conclusion by measuring skulls over 10 to 15 years. The discovery could have political implications in Xinjiang. National Geographic magazine writer Thomas B. Allen, in a March 1996 article about the mummies, recalled finding a potsherd bearing the fingerprint of the potter. When he asked to take the fragment to a forensic anthropologist, Allen said a Chinese official asked whether the scientist "would be able to tell if the potter was a white man." When Allen said he did not know, the official pocketed the fragment. For centuries, the majority population of Xinjiang has been Uighurs, people who speak a Turkic language. Since the 1950s, millions of ethnic Chinese have moved to the territory, and the Uyghurs have felt the pressure. 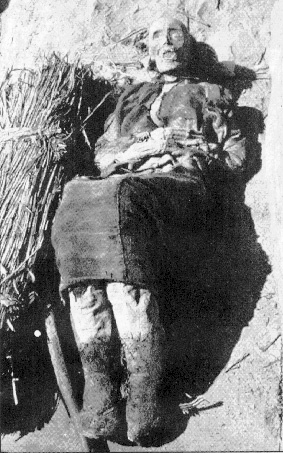 One mummy of a woman found in 1980, known as "the beauty of Kiruran," has become a favorite of Uighurs viewing the remains in the Xinjiang Museum. "I have been in the museum when Uighurs come up to the display case and call her 'our ancestress.' This shouldn't be a political issue. It's unfortunate, but unavoidable," Mair said. The racial question seems absurd to Dr. Dolkum Kamberi, a visiting research scholar at Penn. Kamberi, a Uighur archaeologist who has recovered several of the mummies, said he prefers to call them "Taklimakanians," for the desert where they are found. "Everybody tried to claim that these mummies belonged to their group," he said. "They lived there (in the desert), and after they passed away, they were buried there. They belonged there." Mair believes that Beijing recently has become less sensitive about the issue and noted that five major archaeologists at the conference came from China. Others came from Italy, Russia, Finland, Germany, France, England, Taiwan and Hong Kong. "This will impact the whole study of humanity"
Textiles also were a major topic at the conference. Some of the weaving in the mummies' garments has been described as diagonal twill, very similar to a type found in Europe before 500 B.C. Other papers looked at chariot designs, metallurgy and genetic evidence. There is a downside to all this discovery. The exhumed mummies, no longer under a protective blanket of sand, are being exposed to humidity, mold spores and other hazards of modern life. "It's enough of a threat that it's better now to not to dig up any more," said Mair. "Occasionally now, when archaeologists come across a new corpse, they put it back in the ground. "We know where many corpses are located, but we are leaving them in the ground." Kamberi, who grew up listening to legends about his ancestors and ancient peoples, said the stories inspired him to study archaeology. He believes that modern people can learn from the mummies of ages past. "This will impact the whole study of humanity," he said. "Without Uighur history, there can be no central Asian history. Without central Asian history, there can be no Asian history. Without Asian history, there can be no world history." More on Uyghurs: Press here!